Indian eCommerce industry is currently going through a very interesting phase. Lots of startups are opening, getting VC funded and then closing down. On the other hand, data reveals that more and more Indians are shopping online and the market is growing at a rate of 33% yearly. Indian eCommerce market currently stands at $12 billion, which is expected to grow to $38 billion by 2015 and expand to whopping $78 billion by 2020. Even top brands like Puma has witnessed staggering growth in their online sales volume inside India; while in 2010, only 1% of Puma sales came from online medium, today, this figure stands at an impressive 15%. What goes through inside the mind of an Indian online shopper? What stops him from buying online or what inspires her to choose an ecommerce store compared to brick and mortar outlet? 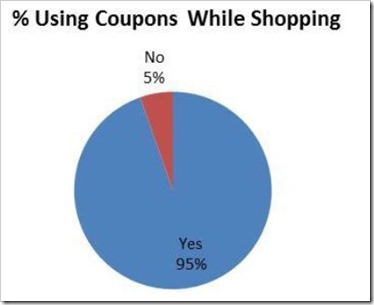 I wish I had these answers; but for time being, let’s take help from an interesting survey conducted by CouponRani.com. The survey respondents were young and restless. 53% of those who answered the survey questions were under 25 years of age and typically, this is the age group which understands and acknowledges the power of Internet. As a matter of fact, 18-25 year olds constitute the largest user-base of Facebook inside India. Hence, the survey strikes the right chord for practical reasons. 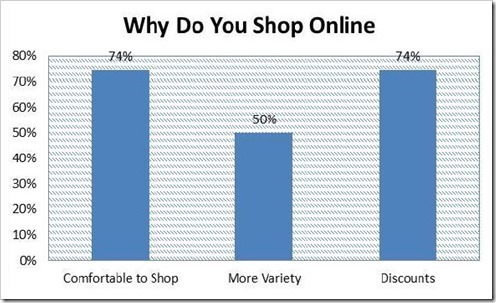 1 Why do Indians shop online? 2 How much shopping is done online? 3 Does Coupons and Deals Matter? 4 Where do they search Coupons and Deals? 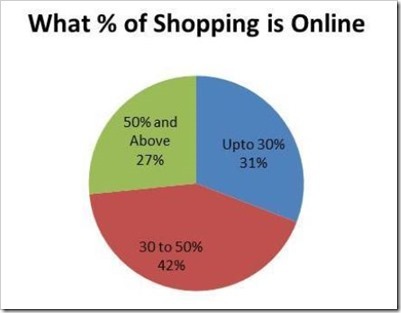 Why do Indians shop online? India youth says Convenience and Discount are the major factors which compels them to shop online. 74% of all respondents cited these two primary reasons for going online. Product variety as a reason comes at a distant second with 50% response. This shows that Indians want to save time and money both at the same time. How much shopping is done online? Over 27% of respondents shared that their 50% of all shopping activity is done online. This was hugely surprising and inspiring as online shopping only constitutes 1-3% of total retail market in India. 31% of surveyed people admitted that online shopping constitutes less than 30% of their overall shopping activity. This suggests that more and more people are now comfortable shopping online and the trend is only increasing. Does Coupons and Deals Matter? Besides convenience, coupons and deals are the most important factors for an online shopper in India. It was revealed that 95% of all respondents search for coupons and deals before making any online purchase. This throws light on the price war which is currently going inside Indian ecommerce market. And most probably, this is the reason that so many eCommerce startups are shutting their shops. Digital Entrepreneurs need to find creative ways to offer coupons and deals for customers, so that price is not compromised and the shopper get more value for money. This is a factor which will need more brainstorming and testing. Where do they search Coupons and Deals? Coupon sites are top destination for searching attractive deals and coupons for online purchases, as 74% of respondents told that they visit such sites before making a purchase. 46% of respondents used Google to search for these coupons and 42% relied on Social Media. 33% visited Merchant sites and 16% searched newspapers to get some good offers and discounts. The survey results tell us that today’s Indian online shopper is smart and suave. He is empowered with knowledge and he knows what he wants. He wants to save his time and money and will leave no stone unturned to discover the best possible deals. He is comfortable using internet and doing shopping online. Do these survey results resonate with your online shopping methodology? Do share your valuable feedback in the comments section! "What Indian Online Shoppers Want? [Survey Results]", 5 out of 5 based on 1 ratings. Iam looking for deals were can i find it. Main reason for online shopping is to save money. Using Couponrani Coupons and other online coupon providers we can even save more. Great post. The survey reveals the entire truth that online shopping is going to be the next big thing in india. With internet users crossing 200 million mark and only 10 % of India’s population is online.The online shopping has a huge potential in india.